Richmond, VA based SG Designs consults for & designs sustainable green projects including greenroofs, living walls, native & edible landscapes, and raingardens – helping to introduce this wonderful new niche to the Virginia market. We use a collaborative approach with a network of the best local experts and companies to develop customized projects such as native	plantscapes, permaculture ‘Edible Forest” designs, stormwater run-off systems, and other innovative solutions to practical problems. 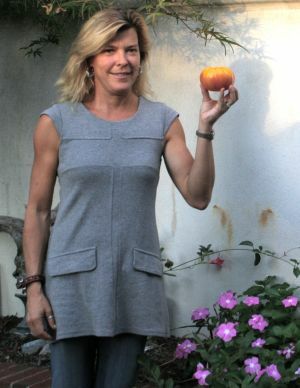 After many years as a documentary filmmaker Scotty Guinn Dilworth, a Richmond native, recently moved back to Virginia from the West Coast where she began her training in sustainable garden design. Scotty apprenticed under several designers in the Los Angeles area where she learned to use low maintenance native plants, slow water drip irrigation, edible gardening and other techniques for a more ecologically sensitive use of residential and commercial spaces. She is a member of the James River Green Building Council, Greenroofs for	Healthy Cities, the Virginia Nursery & Landscape Association and is currently studying for the Green Roof Professional Exam and the LEED Green Associate Exam. In addition to SG Designs Scotty joined the non-profit Tricycle Gardens in 2009 as a Project Gardener. Scotty works with the Science Museum of VA on the first permaculture exhibit, "The Edible Forest Garden" and the Bon Secours Regional Memorial Medical Center's Healing and Food Garden. She also participates with the children's learning garden program at the Peter Paul Development Center in Richmond's East End. Tricycle Gardens' leverages Scotty's experience in sustainable garden design and implementation	when contracting with partner organizations.